A native of Fairfax, Virginia, Dr. Pamela Wiggins is a three-time International author and co-author, national speaker, Florida Supreme Court Certified Family Mediator, Certified Arbitrator, Adjunct Professor, and Certified Lean Six Sigma Green Belt. Dr. Wiggins is CEO & Owner of two businesses: Wiggins Management & Consulting, LLC, specializing in staff training & development, leadership coaching & mentoring, family mediation, and arbitration, and RC Wiggins Properties, LLC, specializing in real estate property acquisitions. She is an outspoken advocate with a message of empowerment to live your purpose today, not tomorrow. Dr. Wiggins has been interviewed by WJXT4 Television-The Local Station/ News4Jax in Jacksonville, Florida. 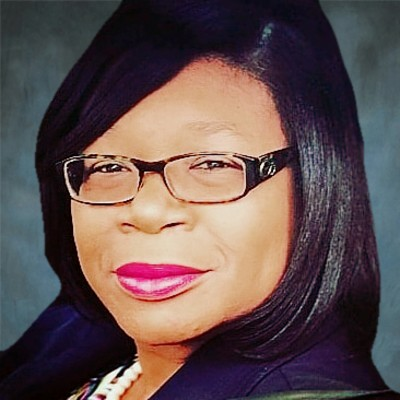 She has been featured in the Jacksonville Business Journal, “Women on the Move,” Today's Purpose Woman Magazine, "Must Read Books for 2019" book entitled, "Women of Purpose" chapter title, "Breaking Down Barriers," and Folio Weekly Magazine, “Honored Business, Jacksonville’s Finest 2016 Business Profile Series.” Dr. Wiggins has facilitated programs she authored (Top 10 Soft Skills You Need: In the Workplace and Beyond, Increasing Your Happiness, Business in Review, and What is Your Return on Investment) in Florida. She consistently inspires hundreds of individuals through one-on-one consultations, workshops, and webinars to develop and live their purpose. Dr. Wiggins earned her Doctor of Education in Organizational Leadership from Nova Southeastern University, Master of Arts in Organizational Management from University of Phoenix, and Bachelor of Arts in Psychology from Marymount University. Her diverse professional career spans from corporate business to higher education to social services with over 12 years of corporate executive leadership experience as Chief Executive Officer; 15 years of experience in staff training, coaching, and mentoring; eight years of experience in quality management and auditing; 12 years of experience in social services and Family Safety programs; over four years of executive leadership in higher education as Interim Dean of Academic Affairs, Associate Dean of Academic Affairs, and Faculty Team Lead. In addition, she has 16 years of teaching experience in higher education online, hybrid, and ground courses, as well as developing and revising course curriculum. Dr. Wiggins diverse career has led to over 15 years of effectively developing plans of action from program inception to completion; successful achievement of higher education institutional re-accreditation; analyzing program results and presenting findings to leadership; seeking out new, creative program ideas to implement into existing programs; fostering ongoing professional growth and development; setting goals for programs; tracking progress, set-backs, and overall performance; managing quality improvement programs and projects; providing strategic vision and strong leadership while directing programs, and ensuring programs and staff are fully supported while advancing organizational vision and mission statements. In addition, Dr. Wiggins publications include: “Women of Purpose” Chapter title: “Breaking Down Barriers;” “Getting to You: Increasing Your Happiness;” Top 10 Soft Skills You Need: In the Workplace and Beyond,” and most recently, the publication of her very own magazine, "American Lifestyle" available in digital and print editions. Nominated for “Prestigious Author Academy Award in Business” for 2018. Recipient of Cox Media Group, “Business of the Week” for the week of January 29, 2018. Featured in “Women on the Move,” Jacksonville Business Journal, 2016. Recipient of “Honored Business, Jacksonville’s Finest 2016 Business Profile Series,” featured in Folio Weekly Magazine, April 27, 2016. Treasurer, Greater New Hope Ministries, Inc., Jacksonville, FL. Certified Arbitrator, Present, Better Business Bureau. Wiggins, P. (2019, March). “Breaking Down Barriers." Talk presented at Family and Friends Devotional TeleConference, Jacksonville, FL. Wiggins, P. (2018, December). “An Attitude of Gratitude." Talk presented at Greater New Hope Ministries, Inc. Jacksonville, FL. Wiggins, P. (2018, November). “Leader, Guide, Guardian.” Talk presented at Greater New Hope Ministries, Inc. Jacksonville, FL. Wiggins, P. (2018, October). “Introduction of Business.” Talk presented at National Association of Women Owned Small Businesses. Wiggins, P. (2018, September). “Look Up.” Talk presented at Greater New Hope Ministries, Inc. Jacksonville, FL. Wiggins, P. (2018, June). “How to Pray.” Talk presented at Greater New Hope Ministries, Inc. Jacksonville, FL. Wiggins, P. (2018, April). “Lead by Example via Transformation.” Talk presented at Greater New Hope Ministries, Inc. Jacksonville, FL. Wiggins, P. (2018, January). “A Plan for Life.” Talk presented at Greater New Hope Ministries, Inc. Jacksonville, FL. Wiggins, P. (2017, December). “Reason for the Season.” Talk presented at Greater New Hope Ministries, Inc. Jacksonville, FL. Wiggins, P. (2017, October). “Faith & Trust.” Talk presented at Greater New Hope Ministries, Inc., Jacksonville, FL. Wiggins, P. (2017, June). “Lift Up.” Talk presented at Greater New Hope Ministries, Inc., Jacksonville, FL. Wiggins, P. (2017, April). “Business in Review.” Talk presented at International Westside Church of God of Prophecy, Jacksonville, FL. Wiggins, P. (2015, April). “What is Your Return on Investment (ROI)?” Talk presented at Cedar Creek Christian School, Jacksonville, FL. Wiggins, P. (2018). Women of purpose: Breaking down barriers. Higgins Publishing. Wiggins, P. (2016). Getting to you: Increasing your happiness. CreateSpace Independent Publishing. Wiggins, P. (2015). Top 10 soft skills you need: In the workplace and beyond. CreateSpace Independent Publishing. •	Nominated for “Prestigious Author Academy Award in Business” for 2018. •	Recipient of Cox Media Group, “Business of the Week” for the week of January 29, 2018. •	B.I.G. Event Team Storyboard Green Belt Project, 2018. •	Recipient of “Honored Business, Jacksonville’s Finest 2016 Business Profile Series,” featured in Folio Weekly Magazine, April 27, 2016. •	Florida Sterling Council Board Examiner, Florida Sterling Council, 2015. Find out more about Dr. Pamela Wiggins at https://www.wmc-llc.org.